PABLO Iglesias, the leader of Podemos, has insisted that the only options in November’s elections will be Podemos or the PP. 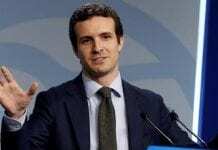 At a party to celebrate the party’s first year anniversary, in Sevilla, Iglesias added that his party is the ‘only option for political change’. But the pony-tailed politician came down hardest on the PSOE leader Pedro Sanchez. “I have tried to point out something that is very clear, and that is that Sanchez is lost and full of doubt,” Iglesias told Spanish daily El Pais. But Iglesias himself has still not ruled out an allegiance with the PSOE, if they make a ‘180 degree turn, and if they admit that austerity measures were a mistake’. Teresa Rodriguez, Iglesias’ second-in-command, criticised Junta President Susana Diaz, along with the ‘hereditary bureaucracy’ of the PSOE that has created an ‘aristocracy’ in Andalucia. 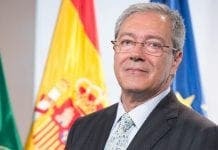 Following the Sevilla meeting, a spokesperson for the Andalucian socialists, Mario Jimenez, said that Iglesias had only come to Andalucia ‘to insult’.